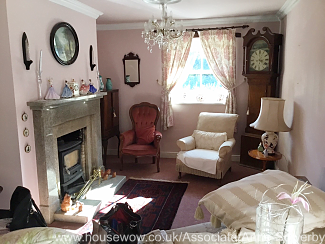 These clients in Cumbria wanted a lounge makeover with a solution for a hidden door. 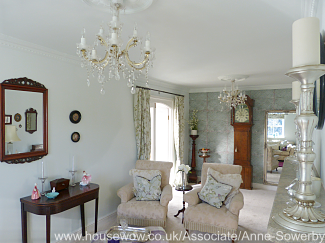 Anne Sowerby solved their dilemma and helped them to style their lounge in a classic, less pink way! 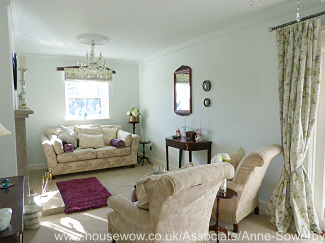 Anne describes her styling journey in transforming this small and cost lounge in Waverbrige, Cumbria. "Every home has good and bad features, so when making over a room the trick is to turn the negative into a positive and turn every room into a place you love. Last month, I was asked to help a client style their lounge. 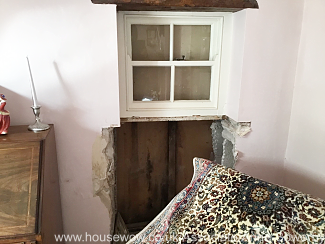 The room was narrow and contained an unusual feature - an unsightly hidden door to a holiday cottage. Due to building regulations they had to keep the door but didn't want it visible and were desperate to make their lounge feel more spacious. 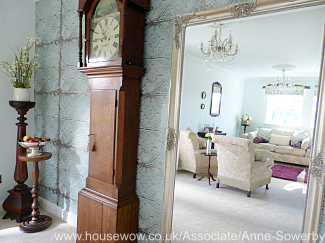 The client initially wanted wood panelling but due to timescale and cost, this wasn't feasible. Instead, I suggested the idea of making the room wider by adding quality effect wood panelling wallpaper. 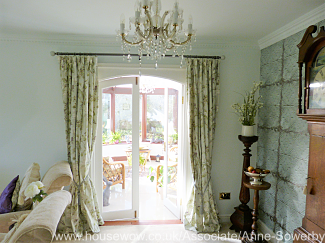 This created the desired effect of making the room appear less narrow. The next challenge was what to do with the hidden door. I decided to hang a very large mirror on top of the door frame which concealed the door and at the same time created extra light and interest in the room. 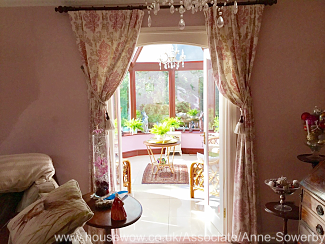 I added a neutral light coloured carpet which matched the tiles in the adjoining conservatory to make the two rooms flow better. The previously dark walls and ceiling were painted a lighter teal blue using Dulux Carrie matt emulsion to brighten the room and make it appear bigger. The remaining accessories and artwork incorporated a mix of the client's own antiques with some contemporary pieces which gave the room a perfect balance of new and old. I think the new room looks stylish and inviting - what do you think? " This client couldn't imagine how they could change their lounge to update the style and colour and also hide an unsightly door. 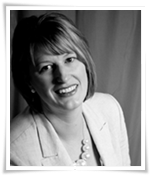 However Home Stagers and property stylist have creative and ingenious methods of getting more for less. They can look at a problem and create a stylish solution which the homeowner would never have imagined. 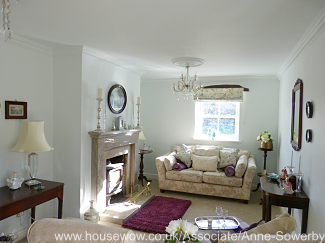 This couple were delighted with their home's transformation.